A group of shareholders holding 49% in SkyViet Airlines Joint Stock Company proposed dissolving the company a little more than a year after its establishment. Vietnam Airlines (HoSE: HVN), in which All Nippon Airways holds 8.771%, has just released a document on the key issues that will be put to shareholders for approval at the 2017 annual shareholders’ meeting expected to be held on June 20. According to the document, regarding the establishment of SkyViet through restructuring the current subsidiary Vietnam Air Services Company (VASCO), two shareholders related to Techcombank, Techcom Capital and Techcomdeveloper Project Development Company Limited (Techcomdeveloper), have proposed dissolving SkyViet. In March 2016, Vietnam Airlines, Techcom Capital, and Techcomdeveloper established SkyViet with a chartered capital sum of VND300 billion (US$13.22 million). Vietnam Airlines holds a 51% stake, while Techcom Capital holds 48 and Techcomdeveloper 1%. The company received its business registration certificate on March 10, 2016. On April 18, 2017, TCO Vietnam Investment Joint Stock Company (formerly Techcomdeveloper) sent a document to Vietnam Airlines proposing either that the other shareholders buy TCO’s stake in SkyViet or that they dissolve SkyViet entirely. On May 3, Techcom Capital sent a document to Vietnam Airlines asking the latter to dissolve the company. While waiting for procedures to be completed, VASCO is going to continue operating as a subsidiary of Vietnam Airlines. 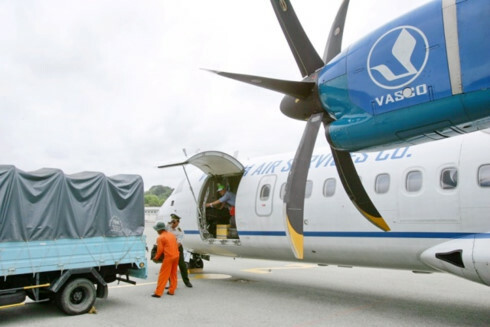 VASCO currently operates short-haul flights from Ho Chi Minh City to nearby islands and localities. In 2017, the company expects to carry 663,000 travellers, up 12% on-year, and have a seat filling rate of 77.4%. SkyViet applied for permission to fly commercially in March 2016 and has yet to receive a decision. Besides SkyViet, in the race to join the Vietnamese air travel market there remain three airlines, namely Vietstar Airlines, Viet AirAsia, and Viet Bamboo Airlines. Vietstar Airlines will be a domestic cargo flyer. Viet AirAsia is a possible joint venture between Thien Minh Group and AirAsia (the two corporations announced establishing the company in April this year), while Viet Bamboo Airlines, a subsidiary of FLC Group, has just been established last month.